Kerri inspired my love for the combination of figs and prosciutto when she hosted pizza and game night back in April. I decided to experiment with the sweet and savory combination, and recently I blogged a dried fig jam recipe with the intention of using it as a substitute for pizza sauce. This elegant flatbread recipe requires no measuring, and can be made simpler with store bought fig jam and pizza dough. 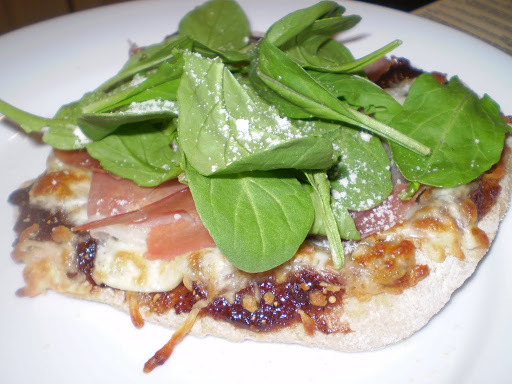 Oh, and although Brent was not a fan of dried fig jam by itself, he loved this pizza! 2. Roll out 1/3 of the pizza dough as thinly as possible. Place on a large baking sheet. 3. Drizzle lightly with olive oil and sprinkle lightly with kosher salt. Spread fig jam over the surface of the dough. Sprinkle lightly with salt. 4. Lay sliced of mozzarella all over the surface, and top with proscuitto Sprinkle lightly with salt and freshly ground pepper. Bake for 12 to 15 minutes, or until crust is golden and cheese is bubbly. All ovens are different, keep an eye on it! 5. Just before serving, sprinkle on arugula and Parmesan. 6. Cut, serve, and enjoy. It is all about Brent. He tests everything! When will thirdculturefoodie announce that it will have a new headquarters? And will that change the approach of thirdculturefoodie? This looks delicious, I will share soon with my audience at runopedia.com and link back to your website.